The school-age assessment forms are the CBCL/6-18, completed by parents or surrogates; the TRF/6-18, completed by teachers and other school staff; and the YSR/11-18 completed by youths. Different norms can be selected for a child’s CBCL, TRF, and YSR scores. If norms are unavailable for a society, you can elect default norms or other norms deemed appropriate for the child. The same scale scores can also be displayed with different norms. The Module includes the Obsessive-Compulsive Problems, Stress Problems, Sluggish Cognitive Tempo (not on YSR), and Positive Qualities (YSR only) scales. Empirically based syndrome scales scored from the CBCL/6-18, TRF, and YSR are based on factor analyses coordinated across the forms. The DSM-oriented scales are scored from all three forms. Inattention and Hyperactivity-Impulsivity subscales are also scored from the TRF Attention Deficit/Hyperactivity Problems scale. The MFAM enables you to enter and compare data from the CBCL/6-18, TRF, YSR, ASR, and ABCL. This is especially valuable for family-oriented approaches to working with children and parents. Bar graphs display side-by-side comparisons of scores on 7 syndromes and 4 DSM-oriented scales that have counterparts for ages 6-18 and 18-59. The bars are normed by age, gender, type of informant, and society. If users deem it appropriate, they can show parents the bar graphs to help them understand variations among reports by different informants regarding their child’s functioning and their own functioning. The bar graphs also enable parents to see similarities and differences between what is reported for their child and for themselves. This can strengthen therapeutic alliances with parents to change their own behavior, as well as their child’s. 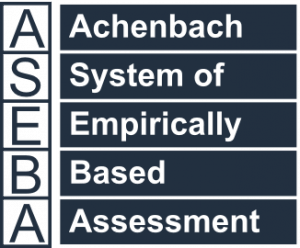 ASEBA provides optimal evidence-based, normed tools for identifying intervention needs, monitoring progress, and evaluating responses to interventions for behavioral, emotional, and social problems. We revised the school-age forms in 2001 by replacing problem items that were unscored or rare with items that sharpen assessment of important syndromes. Factor analyses showed that the new items concerning alcohol and tobacco use and breaking rules load on the syndrome designated as Rule-Breaking Behavior, which is a revision of the Delinquent Behavior syndrome. The new items concerning failure to finish tasks and being easily distracted load on the revised Attention Problems syndrome. The new item concerning lack of enjoyment loads on the Withdrawn/Depressed syndrome, which is a revision of the Withdrawn syndrome.